An all new pitch mower from MowMaster Turf Equipment which is a budget priced product but with all the requirements to still cut the perfect pitch. Dual clutch transmission with high clip rate and easy manoeuvrability, this machine will handle the precise cutting practises you need on your turf pitch and its Extremely easy to maintain. 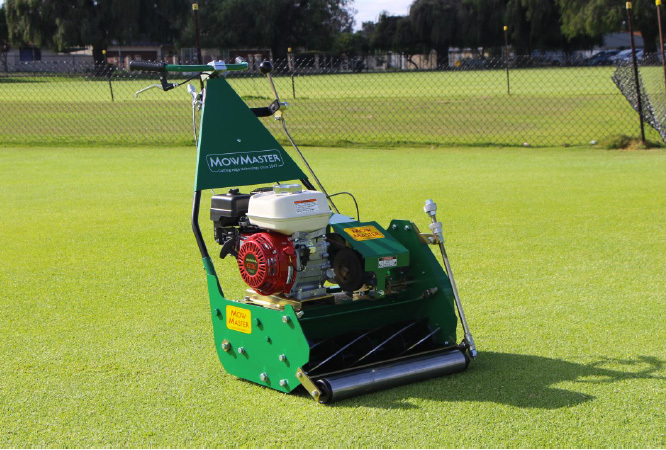 It has MowMaster quality, the same quality that has secured MowMaster as the no.1 product in machinery to maintain turf cricket pitches. Although the R22W is not quite as heavy duty as our Premium pitch mower range, this machine is a very capable product. Its major components such as the cutting steel, Height Adjustments & Twin Clutch drive system are built very similar to our Premium Range of Turf Pitch Mowers. MowMaster Turf Equipment was established in 1947. The company has always focused on the manufacture of specialised, professional, heavy duty, walk behind turf equipment.